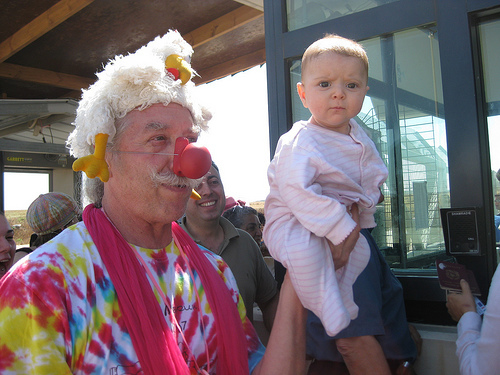 You had to see it to believe it: Hunter “Patch” Adams, MD, fully decked out in his clown outfit, and a retired Israeli military general standing together in an enormous pair of red silk underwear. Patch calls it his “underwear security,” a play upon “undercover security.” It’s an ingenious device which encourages egotistical disarmament. You can’t climb into Patch’s underwear if you are overly-defended. Ibrahim’s insight certainly came to life during our three attempted crossings into Gaza. During our first attempt, we were joined by “Kassamba,” an Israeli anarchist band whose name roughly translates into “sound rockets,” and a troupe of clowns. Kassamba, Patch and the Israeli clowns had all of us dancing, laughing and smiling in an area that was filled with miles of fences, guard towers, military vehicles and M-16’s. When our passports were returned to us and our entry denied, Patch took the passports and started a game of poker with them just underneath the checkpoint booth, a move that had the Israeli guards looking on in amazement and amusement. When Patch reached out his hand to one of the guards, the guard reached back and clasped Patch’s hand with a strong grip. In this case, the hand that clasped the other had to first release his hand from a gun. “Score, humanity!” at least for this moment. Though the gates to Gaza were not opened for us, the gates around my heart were opened. Far from being dispirited, I know that the roots of my peacemaking practice are stronger and more deeply rooted than ever before. Once again the words of Nasser Ibrahim came to mind: “Never give up!” I will not give up; I have only just begun.